Enter to win a free season to Farmspread! To help celebrate National Farmers Market Week (NFMW), our partners at Farmspread are excited to giveaway one free activated season to a lucky farmers market. embeddable widgets for your website, and more! Make sure your market is listed in Farmspread’s NFMW Directory – if not, get it on the map by adding it here! Fill out the NFMW Directory form here. 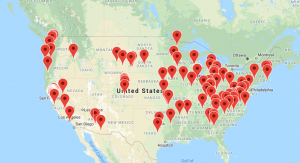 During National Farmers Market Week (August 5-11, 2018), share the link to the NFMW Directory ( https://farmspread.com/nfmw/ ) on social media (Facebook, Instagram or Twitter) along with your market’s plans for celebrating! Use the hashtags #NFMWDirectory and #farmstofoodtofolks. Contest closes Saturday, August 11 at 9pm EST. The winner will be randomly selected and announced by FMC the week of August 13.